I posted a couple weeks back about Mushroom’s epic, epic school tantrum about handwriting wherein I made him shape up (literally, shape his letters more correctly) and I ended up with a kid in tears most of the day. 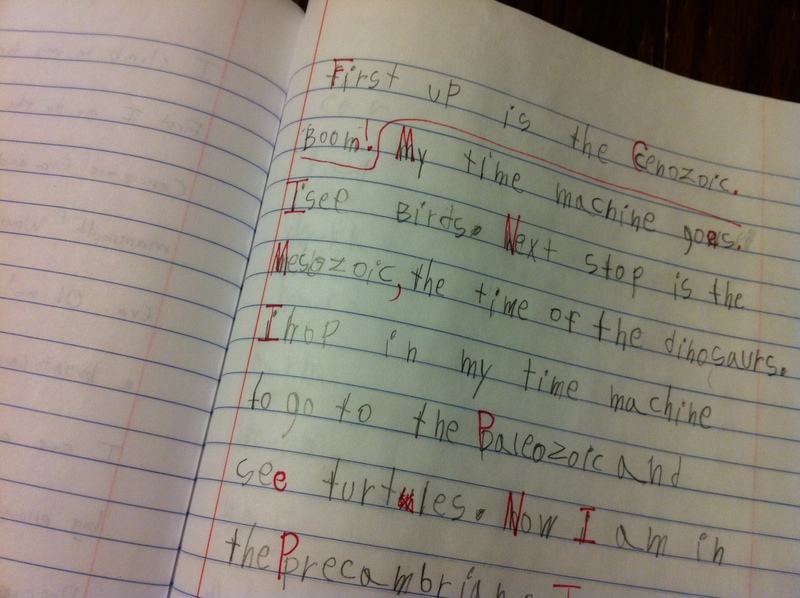 Well, I can report that it has greatly helped his copywork handwriting, which now looks like this. There are still some of those scale issues that led to the tantrum in the first place, but it’s a massive improvement over just a couple of weeks ago. Does that mean I was right to come down hard and make him go through that? I still don’t know the answer. He’s an anxious kid sometimes and it was a trying, terrible time. He is so vulnerable and I find it hard to strike a balance between helping him move forward and helping him feel affirmed and loved. Here’s what I do know. Mushroom has decided in the last few months that he wants to be a writer when he grows up (no more dreams of being a chef and he now disdains the kitchen!). 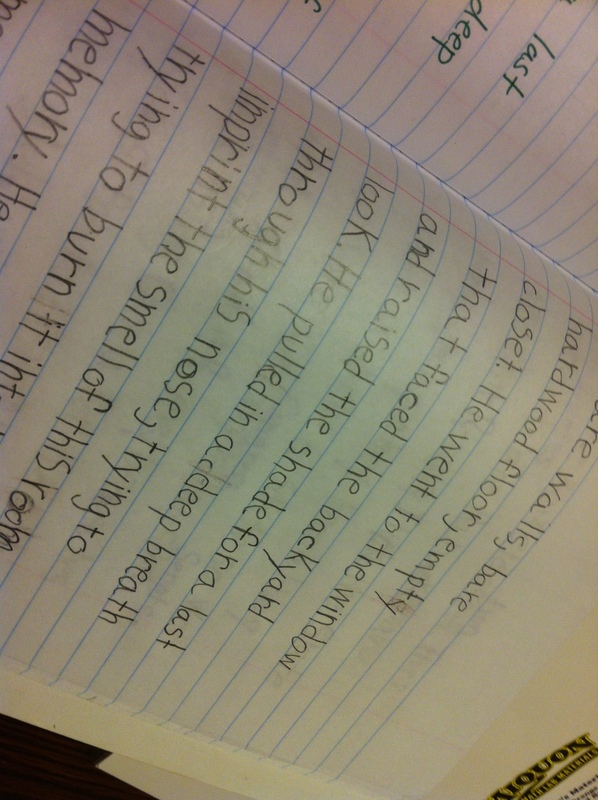 He began filling up page after page of writing. He just keeps going and going. Some of his story ideas are clever and creative. Some of his sentences are complex and well-thought out. 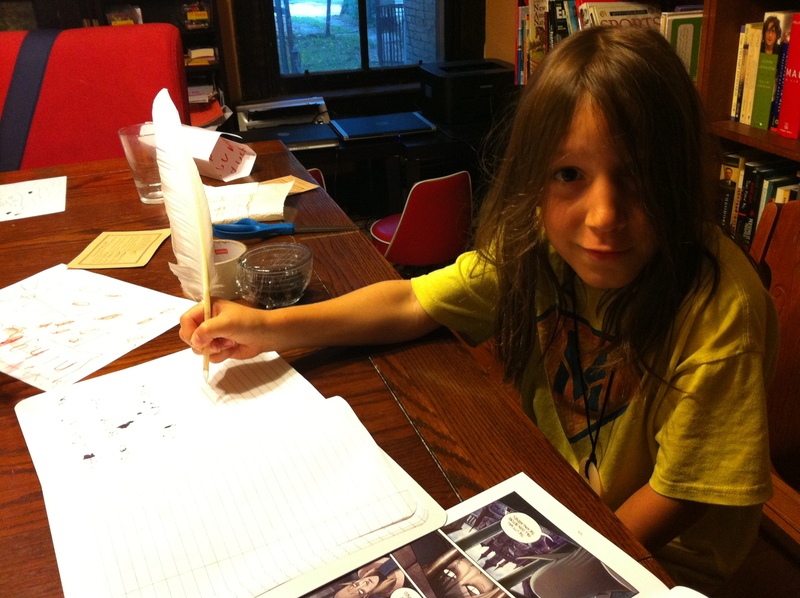 He naturally understands many things about story structure and even metaphor, which just amazes me from an 8 year-old. But while some sentences are lovely, others get lost in the middle and don’t even make sense. Sometimes his spelling is so bad he can’t even read what he’s written. His handwriting is none so lovely as his copywork, that’s for sure. Still, I really want to honor these rambling, scattered pages of his. He is pouring his soul into them and is so happy and proud of himself. Handwriting, spelling, and everything else can come because I know he has that core of creativity and understanding of story. Julie Bogart talks a lot about being on the side of your child as a writer in The Writer’s Jungle and I am trying to be on his side by loving these stories yet still helping him become more coherent so other people can love them too. Right now, he decidedly doesn’t want to do any revisions or have me type them up, so I’m holding off. In the interest of finding that coherence, I have had him write out and post on the bookshelves (we have no wall space, something you may have noticed if you’ve noticed our schoolhouse pictures) a list of the 100 most commonly used words in English. The rule is that he must spell these, at least, correctly. When I catch one misspelled, he must write it out correctly several times, which he has done a few times since we posted them. It does seem to be helping a little. I also gave in and bought All About Spelling. Groan. Not groan because it’s a bad program, which it’s clearly not. Groan because it’s expensive and scripted with lots of bits and pieces and therefore not my style in any way, shape, or form. So far we’ve flown through the introductory steps in Level One and he likes the confidence he’s gaining from it and the fact that there’s now an enormous white board stashed behind the easel that’s just for him. The real test will be when we get to double letters and the ck rule, which will happen very soon. I’ve been working on that with him for… oh, three years or so. If AAS manages to teach it to him, then I’ll be a convert and they can sell me all the bits and pieces they like. 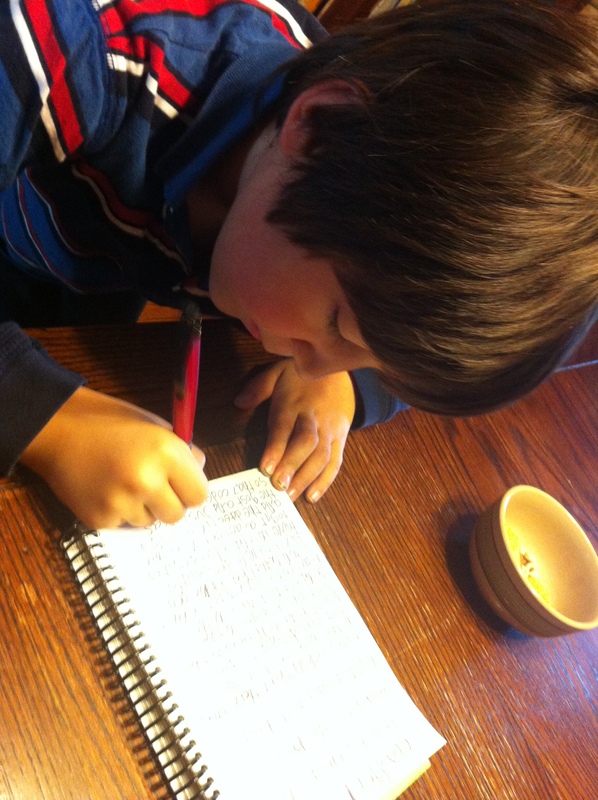 Our language arts program continues to be based on the Bravewriter “lifestyle.” We do copywork or dictation, freewriting, narration, and the poetry tea reading once a week each. We round that out with piles of read alouds, piles of independent reads, grammar mostly through living books, and language games on hand. 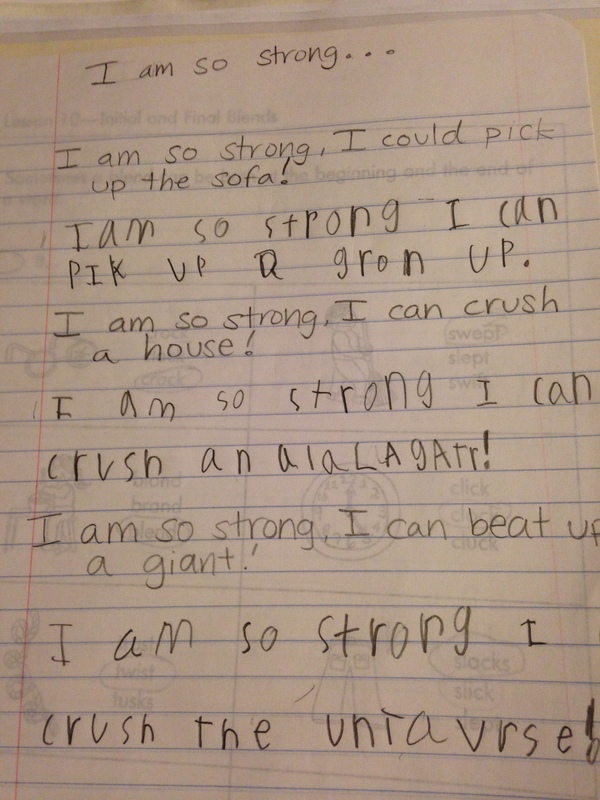 A few weeks ago, I was having a bit of a crisis about Mushroom’s writing, but I’m feeling more confident and hopeful now than I was before. Cross your fingers for no more epic tantrums. 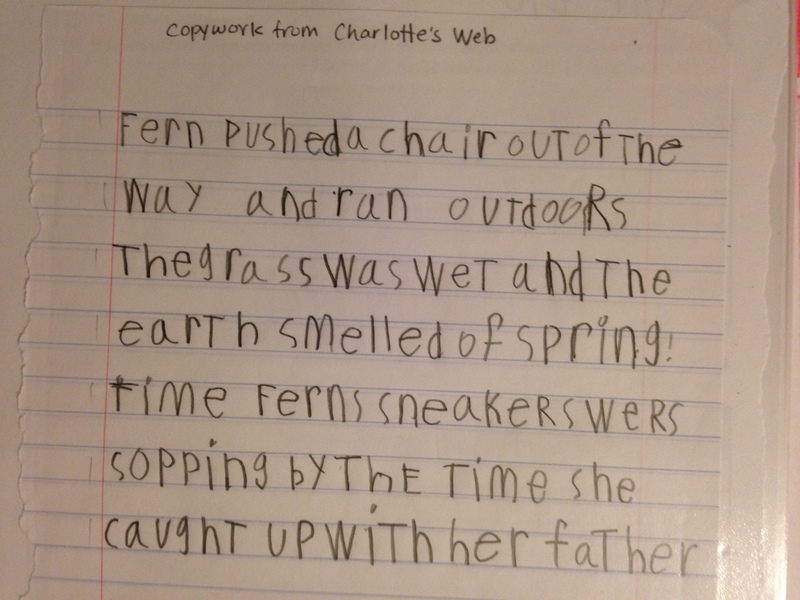 A lot of random thoughts about writing from our winter schooling. BalletBoy has had yet another of his little leaps in skill. Sometimes I think it’s completely pointless that I even bother teaching this child. He plugs along seemingly learning nothing then, suddenly, breaks out and has learned all kinds of things, including things I’ve taught and things I haven’t. Right now, it’s all about writing for him. It’s mostly rather dull writing, but his handwriting is suddenly so readable! His spelling is so decent! His thoughts are all in complete sentences! He remembers periods (if not capitals)! As you can see below, he writes something (in this case, about what he would see if he went back to each geologic era) and then we edit it together. Amusingly, I ask him to chose a color for my edits and he almost always picks red. Mostly, I ask him to find specific things (“Do you see any letters that should be capitalized?”) and I show him things he may not know. In the one below, we talked about how the second sentence would actually have made a better first sentence. Mushroom isn’t there yet, but he’s improving steadily. It’s with writing that I’m really seeing how he’s never going to be a child who had sudden leaps. He’ll probably always be a steady improver. We’re working on some persistent handwriting issues (his “n” and “h” are frequently interchangeable, for example) and his spelling is rather unreadable sometimes, but he has a lot less resistance to sitting down and writing a sentence or two on his own. 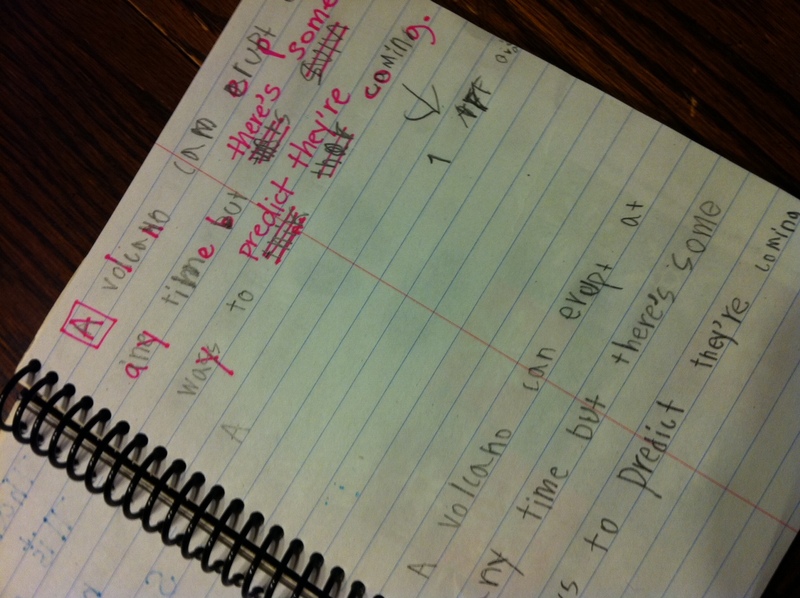 As you can see, we do the same thing with editing his sentences (or, usually, sentence, singular). In the one below, I just asked him to write one thing he had learned about a book we’d just read together about volcanoes. Then I had him recopy it below. A friend suggested the book Your Child’s Writing Life by Pam Allyn for our homeschool book club so I downloaded and read the introduction. To say it didn’t resonate with me is a bit of an understatement. I’m a writer. I’ve written for pleasure all my life. I love writing. I believe nearly anyone can learn to write beautifully and can find things through writing, essential things for life, both practical and personal. However, one of the things I believe about writing is that children should not be pushed to write for no reason because that kills the potential to love writing as I love it. Pam Allyn’s suggestion that children should be pushed to write before kindergarten (and not orally, but actually to write) and required to write constantly in the early grades in order to get better standardized test scores down the road (she mentions various standardized tests repeatedly in the introduction) is exactly the sort of attitude that I believe can ruin that potential to write. I don’t want to dismiss standardized testing, as one needs it for practical things in life. However, if that were the only reason to learn to write, I find it an empty one at best. Not only that, but I’m not sure all this journaling and short story writing by first graders is really all that academically useful. As a longtime writing teacher, I got students at a completely different stage of the process, beyond the learning to put words on the page time and into the learning to put great words on the page time. Now, watching my own children struggle to get thoughts on the page, I find that I still think less is more to some extent. I also find that while I resisted it for a long time, that copywork, narration and spelling have been the things that have helped Mushroom and BalletBoy the most. That, and patience. In the end, that rotten book introduction caused me a lot of grief. I got angrier and angrier as I read it. Then, despite BalletBoy’s sudden ability to knock out a few sentences cheerfully, I let a book that says children should be able to write before kindergarten or we’re underestimating them judge me as a parent and a teacher. I ended up having a full on temper tantrum to the Husband (poor Husband!) about how either the kids were inadequate or I was, because there’s no way at a mere four years old my kids could have written stories. They barely can now. And then I sank into that horrible morass that is comparing your child to others. Don’t worry, I climbed on out. I have to remember that I know the end goal. I’ve helped other kids get there before. There’s just something about writing, isn’t there? And something about taking a different path from the way that kids now learn in public school that makes it harder. I think maybe it’s because writing is so subjective in some ways, so it can really push your insecurities, or at least mine. BalletBoy got really excited to do copywork. With an honest to goodness quill pen and a little bowl of ink. Using his last graphic novel read. Weird, right?